South Florida resident assists YMCA of Palm Beach County to their most successful breakfast event ever. 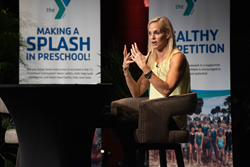 Olympic champion Dara Torres, who is also the most medaled female U.S. Olympian, a NY Times best-selling author, entrepreneur and mom, was the featured keynote motivational speaker on March 6, 2019 at the Palm Beach County YMCA’s fundraising breakfast. Torres, who as a child swam at a YMCA, was chosen as the keynote speaker to share her unique story of overcoming obstacles, pursuing your dreams and never being dissuaded from achieving your goals. Her 45-minute speech brought the crowd to their feet in several standing ovations leaving them in awe of the inspiring story she has to share. The goal was to raise money for YMCA of South Palm Beach County’s 17th annual Inspiration Breakfast. Hosted at the Office Depot Headquarters in Boca Raton for the fifth year in a row, they helped raise over $225,000 at their largest fundraising event of the year where all proceeds benefited their Financial Assistance Program and Drowning Prevention initiatives. In addition to receiving support from many attendees of the event, Torres herself made a significant financial donation. The Olympic great felt it was the perfect time to give back, “I was here to help encourage others to donate but after speaking with the event organizers and many of the philanthropists who donated, I just couldn’t resist in donating to help the cause. The fact that the event raised almost $250,000 was just incredible. I was so honored to be involved. I hope this helps with the Y’s Financial Assistance Program and provides thousands of free swim lessons this summer”. The event was attended by local Floridians who saw this as an opportunity to give back to a program that is saving lives all over South Florida. Many came to see local hero Dara Torres share her inspiring message about how she won three of her twelve Olympic medals after having her daughter and competing at 41 years old, becoming the oldest American athlete to win an individual medal. Torres, who has been booked on hundreds of speeches to corporations, non-profits, universities and business summits, finds warm welcomes as she gives the audience insight into how to become a champion in whatever you choose in life. Torres gives business executives, CEOs and local gift givers the same feeling of being at every practice, every Olympic games and every meeting where someone told Torres she was too old. Torres’ best-selling book, Age Is Just A Number, beautifully illustrates how anyone can use age to their advantage and how they can overcome anything in life if that is their true passion. Now utilized in the public square and frequently copied by writers, Age Is Just A Number has become part of the American lexicon to explain the unexplainable. Whether it was Torres’ heroic feat at the Beijing Games in 2008, Jack Nicklaus’ win at the Masters or Nolan Ryan’s no hitter, all three icons achieved in the face of adversity, being over 40 years old and beating their much younger competitors.